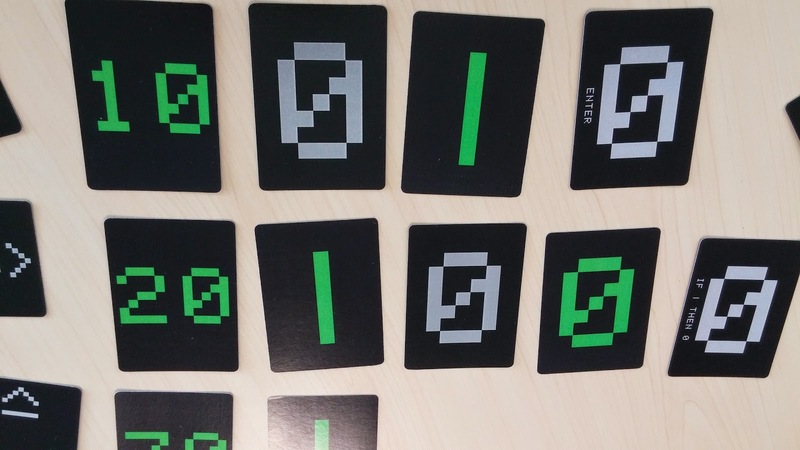 Push Your Luck Podcast: One Zero One : Actual IT Programming in a game? 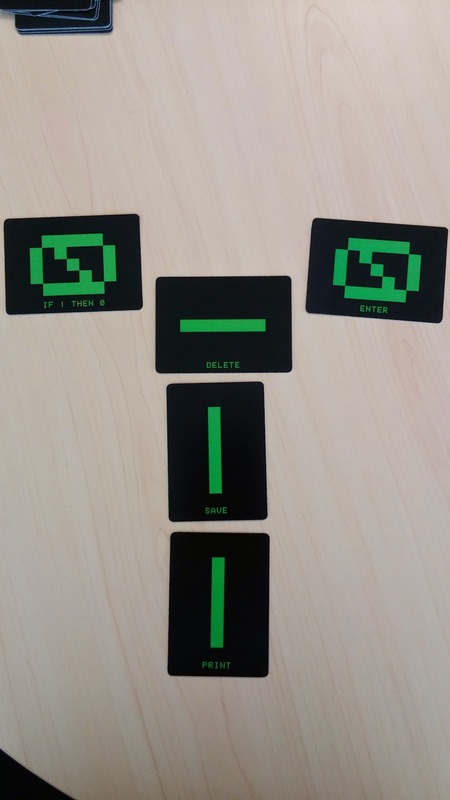 One Zero One is, in its core, a quick area majority game for 2 players. It plays fast (usually about 10-15 minutes) and the areas players are fighting for are actually rows. During a turn, the active player will play a card from his/her hand of 3 into one of 5 rows. The first 2 rows ("10" and "20") are available in the beginning. Subsequent rows ("30", "40" and "50") are only available IF the previous rows have at least 3 cards in them. 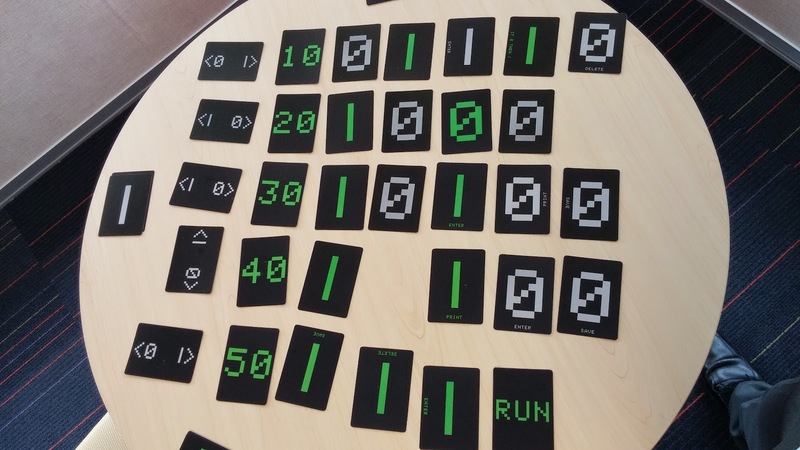 The game will end when the 3rd card has been played in the last row ("50") thus touching and triggering the "RUN" card OR if a player needs to draw a card and there are none remaining in his deck. Players then count up the points for each row depending on the majority (one player will be the "1"s and the other, the "0"s) and the row ("10", "20" etc translate into points) and whomever has the most points will win the game. Art wise its very nostalgic for me. It is rather simple and may not appeal to everyone but for those of us who have programmed in BASIC and the likes or who like retro art style, it will be interesting. Some of the cards you play do have specific actions attached to them thus playing cards are not as straight forward as you may think. An added strategy will be that the direction of the actions on the cards and the orientation of the cards you play will determine which card is affected and that is a nice touch. DELETE action will remove a card. PRINT will allow you to play another card from your hand. IF...THEN will change your opponent's card into yours. ENTER will shift the card to the next row. SAVE will prevent itself and another of your card from being moved or actioned upon. All these make a lot of thematic sense to me because of my background. Though I fear it may not for those who are not in the industry or have programmed before. I keep losing to my colleague! lol.. The different actions available.. and Hello! The game is not without some issues. The cards are double sided which means that players could potentially see what action is on the card on the top of the draw deck and plan accordingly. But this cannot be mitigated because of the nature of the game. Sometimes you have to flip them over. In addition, since at the start players can choose to play for "0" or "1", thus the double sided printing. I will suggest though to just fix it such that GREEN is "0" and GREY is "1". The printing of the actions will thus be on the "0" side for GREEN and on the "1" side for GREY. In that way, players won't be able to see the actions available. Thematically it could be potentially boring and off putting for some who are not in the industry nor who have ever programmed. It is probably not a theme that will get everyone's juices flowing. Still it is a neat game and for such a small package, a lot of fun. There are just enough decisions for you to make and the game length is short enough that you can play again and again. It is also great for lunch time gaming in the office especially if you are in the industry. You can chalk it up to "learning at lunch" ! ﻿Thanks to Grail Games for the review copy! Glad to see a fellow singaporean board game reviewer! Good job eric!